Not too long ago there was something of a frenzy in the Australian media after the Speaker of the House of Representatives, Peter Slipper MP, re-introduced a note of ceremonial formality to the openings of parliamentary sittings. The Speaker revived the ceremonial procession into the chamber, preceded by the Serjeant-at-Arms carrying the Mace, and some journalists speculated that his next step might be to start wearing the long-bottomed judges’ wig last worn by Sir Billy Snedden. They should read this book. There is so much more that a really ambitious Speaker might do. In 1993, despite already having a splendid mace carried before him, the then Speaker of the Canadian House of Commons, John Fraser, presented a ceremonial baton to the House, to be carried personally by the Speaker on the way to the Senate to hear a speech from the throne; for a ceremony signifying Royal assent; or to participate in the installation of a new governor general. ‘A rod Vert at either end tipped and dovetailed inwards Argent ensigned with a lion sejant Argent its dexter forepaw resting on a coronet érablé Argent the rim set with twelve jewels Gules’, the baton was based on the pair of batons incorporated in Speaker Fraser’s arms, granted by the recently created Canadian Heraldic Authority. What Corinna Pike and Christopher McCreery demonstrate in this scholarly and very readable book is that this is a comparatively modest symbol of Canadian authority, and that such things as maces, rods and chains of office are highly potent still in Canadian polity. Some, moreover, are of very recent origin, reflecting their significance in continuing changes in Canadian political institutions. The mace of the Northwest Territories, introduced in 2000 after its partition into Nunavut and the Northwest Territories, has pebbles inside which, when it is moved, makes the mace sound like a traditional rain stick. The gorgeous Nunavut mace is made from narwhal tusk, silver, soapstone, granite and a variety of semi-precious stones. Attached to the shaft are three seals made from granite, marble and lapis lazuli; around the head of the mace are ‘four stylized common loons with heads bowed down towards the centre.’ So important is the mace to the Nunavut Territory that it has two: one on permanent display, and another used as a working mace. When in use the latter is placed on a mace stand, in front of the Speaker’s chair, made in the form of two stone figures representing the people of Nunavut, who hold the ultimate authority granted to the legislative assembly and symbolized by the mace. The explanation that the mace represents a sign of Royal authority transformed into one of democracy, of popular supremacy, described here helps explain Canada’s evident enthusiasm for them. The sheer number of parliamentary maces is also a reminder that Canada is one of the world’s oldest democracies. And even though Nova Scotia, known as the cradle of Canadian democracy, did not have a mace until 1930, everywhere else in Canada acquiring a mace was clearly a high priority as soon as parliamentary self-government was attained. It did not have to be costly, as is evident in the case of Alberta, whose legislature first met in 1906. The Alberta mace cost $150 and was made by a railway carpenter: the shaft was iron plumbing pipe and parts of a brass bedstead, the foot knopf (sic) was probably a plumbing float from a flush toilet, and brackets in the shape of mermaids came from the handles of shaving mugs! This ‘shaving mug mace’ was used for the next fifty years, until replaced with a magnificent new mace made from more conventional materials – but like its predecessor also modelled on the parliamentary maces of the seventeenth century in Britain. Pike and McCreery record that British Columbia has had six different maces, reflecting its early history as two distinct colonies (Vancouver Island and British Columbia). Newfoundland, like many an early legislature, first used a mace made of wood, which was carelessly left behind after the assembly’s first sitting in the house they had rented from a Mrs Mary Travers. When the rent was not paid promptly, Mrs Travers put the mace and other items up for sale, to general consternation. The governor intervened, but we are told that poor Mrs Travers did not get her rent for another twenty years. Indeed, many of the early maces of Canada were inexpensive and improvised, we learn. Wood and other local materials were also used in Upper Canada, Manitoba and Alberta, just as was the case in the Australian colony of Victoria. Its original wooden mace was later lent to the Australian House of Representatives, until the British gift of a silver-gilt mace in 1951, Australia’s jubilee year, allowed it to be returned to Victoria. The wooden mace is still on display in the Victorian Parliamentary Library. This plethora of maces is also a reminder that Canada has long been a monarchy: the mace is the symbol par excellence of the transfer of sovereign power from the monarch to the people. The book concludes with a valuable discussion of the official uniforms of the British Empire as manifested in Canada, which is of great value to Australian readers as well and which adds to our knowledge of several important collection items at this museum. It may be hard to imagine a situation in which a British monarch of our times would decide that all the guests to his coronation should wear official uniform, civilian or military, but such was the case as late as 1937. The Jennings Papers, held by the Research Library at the Museum of Australian Democracy at Old Parliament House, document the exhaustive discussion of what should be worn and on what occasion, following the king’s decree. The measurements of official guests from Australia were collected by the Australian High Commission, so that appropriate garb could be hired in London before supplies ran out; gentlemen were instructed when they should wear swords and when not. The Museum of Australian Democracy has also recently acquired the Privy Councillor uniform of Sir Edmund Barton, Australia’s first prime minister, which is also evidence of the demand for high formalism in dress that Pike and McCreery document–-at times insisted on, it appears, simply so that vice-regal personalities could tell the difference between their own staff and their guests. Vice-regal uniform survives in Canada today more as the personal preference of particular lieutenant governors who choose to wear it themselves than as an expectation of all. Pike and McCreery regret this, commenting that: ‘Ceremonies are very much state theatre; they require a stage, actors, a scenario, and also costumes. The demise of formal dress has removed the sense of occasion from our state events.’ They argue that ‘symbols enrich the nation’s patrimony and help to form a more developed identity beyond simply the national flag, maple leaves, and the beaver.’ Their book is a compelling argument for this proposition, as well as a highly readable account of an aspect of history many may dismiss. The reader will encounter tantalising glimpses of histories that most Australians know little of, but that should stimulate the reader to find out more. The early Manitoba mace, as one final example, has a head carved from the wheel hub of a cart used in the Red River Expedition of 1870, when the Riel Rebellion was put down. It thus encapsulates a compelling history of resistance to Canadian supremacy by the Métis, people who draw on dual Native American and European identities, as well as the defeat of their aspirations. This mace, and the other symbols of authority described in painstaking detail in this valuable title, introduces a story more complex and nuanced than the usual dry account of the role of the mace in Westminster parliamentary tradition. The authors are to be congratulated on a superb achievement. 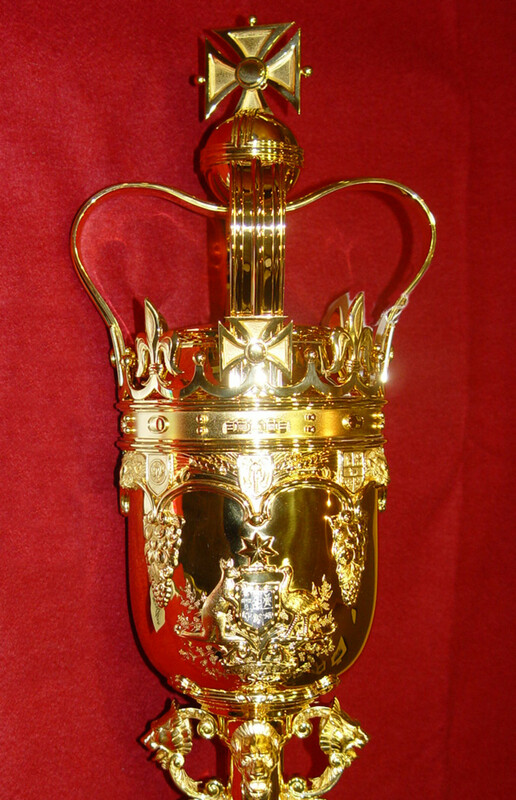 The museum’s mace is a modified replica of the 1951 mace of the Australian House of Representatives. It is displayed in the Speaker’s Suite at Old Parliament House. It is also used in the historic House of Representatives chamber on major occasions such as important addresses, Youth Parliaments, and in some schools’ programs.